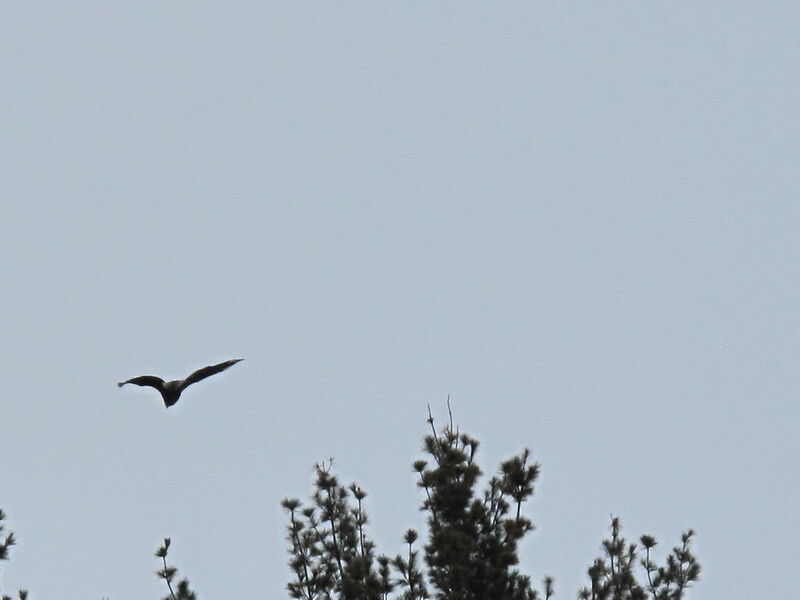 While at Charles Mill Dam yesterday, I saw what I thought was my first turkey vulture of the year. I didn’t get a good look at it, but was able to snap this photo. When I got home and looked at it on the computer, it looked more like an immature bald eagle. This is another post in the continuing saga of the “Gold Rush of 2011,” i.e. the mad dash by Mohican area landowners to sign away their mineral rights to natural gas speculators. I forgot to mention in yesterday’s blog that attorneys speaking at a fracking informational session in Wooster on Wednesday night said that, if people are concerned about the potential for groundwater contamination, they should get their water tested now for chemicals and heavy metals. This is for if and when extensive hydraulic fracturing in our area will poison our wells. Given Pennsylvania’s experience, for some, it will only be a question of when. The attorneys stressed that testing needs to be done by a third-party lab. That includes gathering the samples, a very important point for legal reasons. As I recall, the price range is $60-$300. That said, the experience elsewhere has been that, even when the cause and effect of groundwater contamination is obvious, the drilling companies deny the connection. Even though the ju$ti¢e system would be stacked in favor of the companies, at least this will give you some evidence if it comes to litigation. Failing that, a typical scenario would be that the companies would truck in water for you. Face it folks, life won’t be the same around here. These frackers sure know how to throw a party. 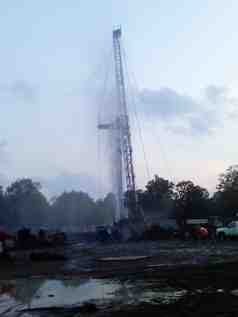 A recent well blow-out in Pa. I learned a few interesting things about the business of hydraulic fracturing last night at an informational session at the Ohio Agriculture Research and Development Center in Wooster, Ohio. This is not to be confused with the session Tuesday afternoon in Loudonville. That one was a dog and pony show put on by a group of Farm Bureau types bent on whipping landowners into a mineral rights selling frenzy. More on that some other time — perhaps when the thought of it no longer induces a projectile vomiting reflex. The Wooster session was conducted by a couple of ag lawyers. Without promoting the leasing of mineral rights to frackers, they discussed the finer points of dealing with them. • A landowner unwilling to lease land to hydraulic fracturing companies, can be forced into a leasing pool by the state if contiguous landowners sell out. The lawyers pointed out that this is uncommon in Ohio. However, given the political and economic climate, you can bet it will become routine. • In Ashland County, there is at least one speculator getting people to sign what they think are letters of intent to lease. Turns out these are actual lease contracts. • Unless landowners specifically demand it, lease contracts allow drillers to build roads, drilling platforms that cover up to five acres, run pipelines or inject mass quantities of wastewater, petroleum and chemicals into the ground. Oops, forgot to mention that, unless landowners specifically negotiate it in the contract, these companies can also use the land for underground storage. • When speculators first come in, they offer lower prices. • The price range? $2 per acre to $2,000 or better. • The pie-in-the-sky royalty figures they quote? Read the fine print. In some cases, that figure is the amount before they deduct their costs. Those costs include building the roads, rigs, laying pipe, disposal and cleanup. It also can depend on whether they actually find gas. Also, those terms are not per year; they’re over the life of the contract, generally five years. • If the company goes bankrupt, the landowner can be stuck with a huge liability. A couple of posts ago, I hinted at this. There is a tendency among those who profit from destroying OUR natural resources to cut and run, going out of business and keeping the money they made with impunity. (It’s easy when you own politicians and judges — easier now that the U.S. Supreme Court cleared the way for unlimited campaign contributions from polluting and pillaging scumbags.) If there were to be a major drilling-related catastrophe, this would be an inevitable scenario. • One of the drilling companies approaching people in our area is based in Saudi Arabia. So much for the argument for energy independence. In the old days, we had a term for the sort of people we’re dealing with here. We called them carpetbaggers. Except these folks are peddling something far more pernicious than snake oil. I’m not one of those difficult restaurant patrons. I don’t get the waiter’s attention by sticking my foot out and tripping him when he walks by. Nor am I one of those people who eats any old crap at home but sends food back to the kitchen every time they eat at a restaurant. But it really irks me when the waiter or waitress asks “Is everything all right?” as though it were a rhetorical question. • By making little or no eye contact. • Looking away or walking away while you’re in mid response. • Asking as they are walking by, obviously preoccupied with some other task. Sometimes, it’s all I can do to keep myself from responding to their indifference by jumping up and performing the Heimlich maneuver on them even. 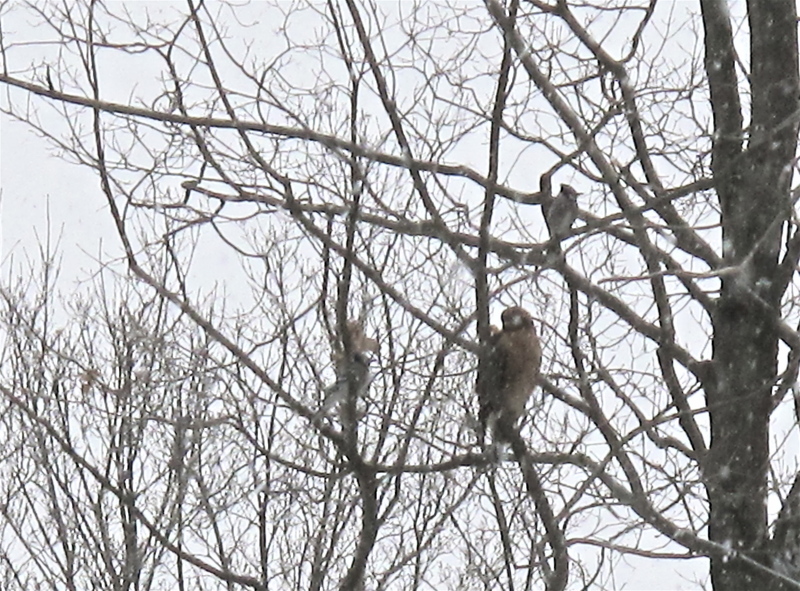 Blury photo of red-shouldered hawk being stalked by blue jays. Before I go any further, let me say that I’ve taken a different direction with this blog than I intended. Which is what I intended. Originally, I fashioned it after my Website with set features. With each succeeding post, I seem to be drifting further away from that. It’s become more spontaneous. I designed the Website to showcase the different types of writing I do or have done. This has become more of a journal — while retaining some of the elements from the Website. That said, here’s today’s observations, which have nothing whatsoever to do with the proceeding. Birds keep me sane. Watching them around the feeders, out the office window (in a treeline about 60-70 yards away), or in the wild. Here at home, the blue jays are among my favorite. They have tremendous entertainment value. I had one perch by the bedroom window and imitate the vibrating sound of my cell phone. One liked to make a zipping sound by dragging its beak across the window screen. After I removed the window screen, it simply made the sound on its own. I can see how their ability to mimic sounds contributes to their survival. Blue jays can assure themselves of a spot at the feeders by imitating hawk calls and scaring off the other birds. They also fend off hawks. Yesterday, as I sat writing in the office at the back of the house, I looked out to see a red-shouldered hawk perched in the tree line. Soon he was flanked by two blue jays. They were waiting for the hawk to fly so they could get behind him, where I’m told hawks are unable to get at smaller birds, and harass him till he left their territory. I got a photo. It’s not very good quality because I didn’t opt for one with a telephoto lens when I bought it. One — of many things — you don’t learn in “J-School” is that part of your job description will be mental health counselor. Your job puts you in a position where you encounter people in their darkest hour. And you will be the one they vent on. You will be sworn at, threatened and maybe even assaulted. It’s a role that requires patience, grace and diplomacy. And a concealed carry permit. I’m kidding about the latter. There was a murder case years ago in which a family member came down to the paper and vented on me in front of God and everyone. I remained polite and calm, maintaining eye contact, trying to convey a message that it was OK to unload, that I was willing to take some of that pain from the guy. Afterward, I told those who witnessed the encounter that he would apologize someday. They didn’t believe me. It was that virulent a tongue-lashing. It took three years, but he did apologize. Sometimes the job can be rewarding in ways you never imagined.